What about browsers that do not support modules? ES Modules is the ECMAScript standard for working with modules. While Node.js has been using the CommonJS standard for years, the browser never had a module system, as every major decision such as a module system must be first standardized by ECMAScript and then implemented by the browser. This standardization process completed with ES6 and browsers started implementing this standard trying to keep everything well aligned, working all in the same way, and now ES Modules are supported in Chrome, Safari, Edge and Firefox (since version 60). In this example, the module defines a single, default export, so it can be an anonymous function. Otherwise it would need a name to distinguish it from other exports. 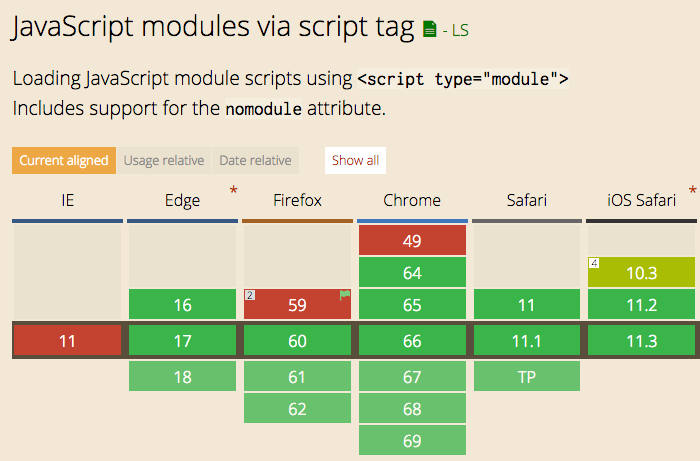 It’s important to note that any script loaded with type="module" is loaded in strict mode. It’s either absolute, or has a ./ or / before the name. ES Modules are one of the biggest features introduced in modern browsers. They are part of ES6 but the road to implement them has been long. We can now use them! But we must also remember that having more than a few modules is going to have a performance hit on our pages, as it’s one more step that the browser must perform at runtime. Webpack is probably going to still be a huge player even if ES Modules land in the browser, but having such a feature directly built in the language is huge for a unification of how modules work client-side and on Node.js as well.